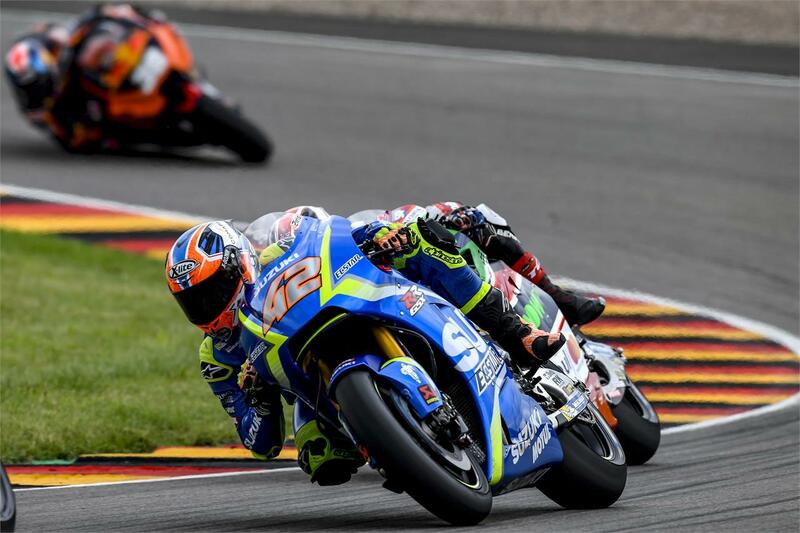 An unlucky race saw Team SUZUKI ECSTAR out of the points at the German GP, with Alex Rins in 21st position at the chequered flag and Andrea Iannone crashed out with only 6 laps to go. The morning’s warm-up session saw both Iannone and Rins feeling good on their bikes and lap with a comfortable pace close to the top ten. Improvements made to the GSX-RR’s had allowed the Italian to end the session in 13th place with 1’22.368 while the young Spaniard followed in 15th with 1’22.386. A good start for Iannone gave him the spark to overtake other riders and gain a better position in the first lap. He then let those feelings carry him into to a pace nearly as fast as the race leader, closing in on the top ten. The quick pace continued with some overtaking and some being overtaken, until lap 25 when he lost control of the front of his GSX-RR, finishing his German GP in the gravel. It was a positive start for Alex Rins as well, who managed to advance by five places in the first seven laps, before having to give up on the pace due to the drop in tyre performance. His determination allowed him to make up some of the gap he left in lap 8, although unable to end the race better than 21st. The Team and riders will now take a one month break before the Czech GP (5th August) which will allow them to rest. They will also revise data and work on development as they get ready for the second half of the season.